THE little Chicken said to her mother, 'Mother, please bake me a cake.' The old Hen consented, and asked her daughter to bring some firewood splinters, which human beings threw away. 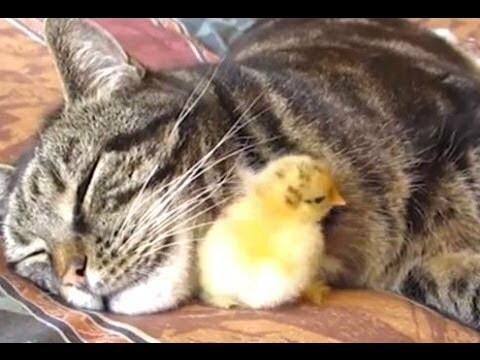 So, the little Chicken went into the kitchen of a nearby house, but as she was picking up some firewood splinters, an old Cat found her and threatened to eat her. "If you will be so kind as to let me go, 'pleaded the tittle Chicken,' I will give you a piece of my cake." All right, "said the old Cat. "You greedy little thing, 'scolded the old Hen"
‘Follow me,’ said the cold Hen, and rushed into the kitchen of the nearby house. The little Chicken allowed. The old Hen and the little Chicken looked round for a hiding place in the kitchen and, discovering a big earthen jar, they slipped inside it. The old Cat saw the Hen and the little Chicken running away and felt very angry. Where is my share of the cake? " he shouted. "I will eat you up, you greedy Chicken, and your mother too. ' He followed the fugitives into the kitchen, but although he cast his eyes round, he could not spy them. "But they must be here," he argued to himself, for I saw them running in here and, moreover, there is only one door. Sooner or later, they must come out of their hiding place. " So, he sat down in the doorway, and waited patiently. Inside the earthen jar the old Hen and the little Chicken were trembling with fear. After some time however, the little Chicken felt bolder and became fidgety. So, she whispered in her mother's ear, "Mother, I want to sneeze. You will do nothing of the so replied her mother angrily," for the old Cat will hear you and will look inside the earthen jar. Some moments passed, and the little Chicken again whispered, "Please let me sneeze just a tiny bit"
Some moments passed, and the little Chicken again whispered," Let me sneeze just a half of a tiny bit. The mother lost patience and said "yes and the little Chicken gave a loud, loud sneeze. The sneeze was so loud that the earthen jar broke in two exposing the old Hen and the little Chicken to view. Luckily for them, however, the old Cat ran away in fright, thinking it was a peal of thunder. So, the old Hen was able to leave the kitchen safe and sound, with the little chicken strutting proudly behind her.